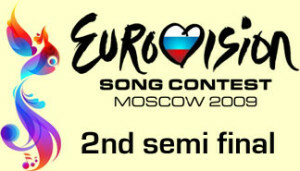 Last week, we at Eurovisionary gave our predictions for the first semifinal. Now we turn our attention to the second semifinal. Croatia – Igor Cukrov – Lijepa Tena – After two or three dodgy years, Croatia is back on form. This is a song in the mould of true Croatian music. Its beauty will win it votes beyond the Balkans. Verdict – It should be in the final. Ireland – Sinead Mulvey & Black Daisy – Et cetera – The country who won the contest four times in the nineties has enjoyed rather less good fortune in recent years. After trying everything from a Turkey to one of their top singers, Ireland is trying rock, a style they haven’t entered before. After a few listens, it’s possible to see it in the final, and there lies the problem. The public will be hearing it for maybe the second time as a maximum. Verdict – Not instant enough to qualify, shame. Latvia – Intars Busulis – Probka – A change of title can’t hide the basic truth, that this is one of the weakest songs in this semifinal. They are to be congratulated for sticking to their own language (if that is indeed what happens), but it won’t be enough. Verdict – Would be a surprise if it qualified. Serbia – Marko Kon & Milan Nikoli – Cipela – The only out and out ‘nonsense’ song in this years contest, a welcome relief after last year, when every other song seemed to be in that vain. They are quite popular in the region and the performance will probably prove sufficiently entertaining to see it progress. Verdict – The performance rather than the song will win it enough votes. Poland – Lidia Kopania – I Don’t Wanna Leave – Poland could be the Iceland of the second semifinal. I Don’t Wanna Leave is a beautiful song but is sandwiched between a memorable performance and the bookies favourite. As with Iceland, it may not last long enough in the memory to scoreenough votes. Verdict – It deserves to qualify but…..
Norway – Alexander Rybak – Fairytale – Currently the bookies favourite, it certainly stands out from the crowd. Lots of lively strings move the song on and keep the listener interested. It might be the bookies favourite, but that is probably because the fans have made it so rather than how likely it is to actually win. Verdict – Almost certain to qualify but how often does the favourite win? Cyprus – Christina Metaxa – Firefly – Almost the victim of a plagiarism scandal, Christina will have to improve a lot on the performance she gave in the Cypriot final if she has any chance at all of qualifying for the final. Verdict – Not even 12 points from Greece will help Cyprus. Maybe the worst performance of the year. Slovakia – Kamil Mikulcik & Nela Pociskov – Let Tmou – Hopefully, it will not be another eleven years before we see Slovakia back in the contest. Kamil and Nela combine well and the song is classy, but those factors might not be quite enough. Denmark – Brinck – Believe Again – If Brinck loses his voice before the big night, he can at least lip-sunch while the songs co-writer, Ronan Keating sings from the side of the stage off-camera. Their voices are remarkably similar. The song could easily come from Boyzone’s back catalogue, too, and would have been a number one for them. Slovenia – Quartissimo – Love Symphony – Having ben a backing singer in previous contests, lead singer, Martina Majerle, finally takes centre stage. The song sounds at times like the ‘Casualty’ theme tune. It is probably competing for votes with the same viewers that the Estonian song will appeal to. It is a stronger song than its Baltic competitor and that should be enough. Verdict – Alenka Gotar reached the final with a song of the same style, expect Quartissimo to achive the same result. Hungary – Adok Zoltan – Dance With Me – This is Hungary’s third choice for the contest this year, the previous two pulling out for different reasons. In all honesty, this is the best of the three, a strong, disco influenced number. Azerbaijan – Aysel & Arash – Always – After the style over substance of last year, Azerbaijan give us both this year. It’s one of the bookies favourites, and while it won’t win outright, it will be very close. Greece – Sakis Rouvas – This Is Our Night – As close to a guaranteed qualifier as it is probably possible to get. A huge star in his part of the world, it helps that his song this year is better than his previous effort. Verdict – You could put your house on Sakis to qualify, but don’t just in case. Lithuania – Sasha Son – Love – If Sasha can avoid the germs that affected Jeronimas Milius last year, then he could make a big impression. Unlike some of the other ballads this year, Love stays in the mind after it ends. Verdict – A place in the final is surely reserved for Sasha. Verdict – Not a chance of reaching the final. Albania – Kejsi Tola – Carry Me in Your Dreams – As usually, Albania were the first to choose their song. They have clearly made good use of the time as the song has really been strengthened. Verdict – As long as nerves don’t bet the better of one of the youngest singers this year, itg’s in the final. Ukraine – Svetlana Loboda – Be My Valentine – Ukraine always do well (unless they are hosting the contest but this is one of their weaker efforts which certainly didn’t need the meaningless suffix to the title. The new version is less messy than the original and it should secure enough votes to be present in the final. Estonia – Urban Symphony – Randajad – This could not be more of as contrast to the nonsense song they entered last year. They can count themselves very unlucky if they don’t qualify for the final. The Netherlands – De Toppers – Shine – Every year, there is a song that the fans love and expect to qualify, and are left scratching their heads when it doesn’t. Step forward De Toppers, that accolade is yours this year. Europe just doesn’t understand this sort of thing, even if fans do. They are sure to be entertaining on stage and a favourite with the press and fans in Moscow, but it isn’t they who vote. Verdict – A wasted opportunity for the Dutch. Pity! That only leaves the Big 4 to discuss. Next week we will be assessing their chances.